Wat U-Mong located on Suthep Road in the town. The spacious temple was found in the reign in King Mengrai around 1296. The renovation was done in the reign of King Kue Na. The large wall like building with a connected tunnel inside is a remarkable piece of art located in the temple compound. A large stupa is located near the temple’s wall. 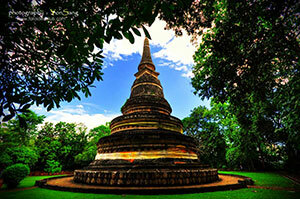 Wat U-Mong is teemed with various kinds of trees, thus making it an ideal meditation place.